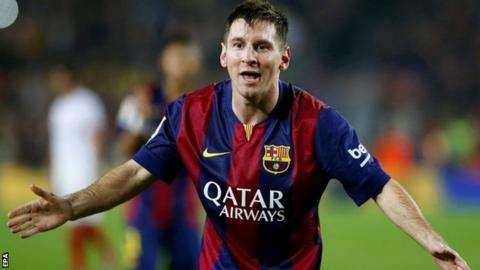 Lionel Messi's Spanish goalscoring record will never be beaten, according to Barcelona coach Luis Enrique. Telmo Zarra's 251 goals had been the record since 1955 but Messi, 27, is now up to 253 La Liga strikes following Saturday's hat-trick in the 5-1 win over Sevilla. "He's a unique player - there'll never be anyone like him and we're lucky to enjoy his presence here," Enrique said. "I think he will leave the record unreachable for anyone else." Enrique added: "Zarra beat it in an age when there were more forwards than defenders." The next highest La Liga scorer still playing is Real Madrid's Cristiano Ronaldo with 197, although he is two years older than Argentina forward Messi.